Things are most certainly moving ahead in the Bachelor Girl best-of stakes, with the band revealing the cover image for the forthcoming compilation via their OFFICIAL FACEBOOK PAGE earlier this morning. But this morning, auspOp can exclusively reveal the album’s tracklist (below). The names of the four previously unreleased tracks are ‘Radio’, ‘To Whom It May Concern’, ‘No Ordinary Day’ and ‘We’re A Natural’. The best-of will also include Bachelor Girl’s version of Duran Duran’s ‘Come Undone’ – lifted from the Aussie covers album ‘UnDone’, released back in 1999. 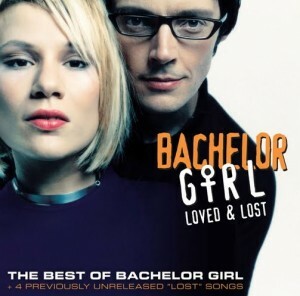 ‘Loved & Lost – The Best Of Bachelor Girl’ hits stores in Australia on Friday April 15. Try ebay, that’s where I got mine. I love them. Their 2nd album isn’t avaliable on Itunes and ive been dying to download Drowning Not Waving for ages. Can’t wait for this. A buyer for sure. We’re not aware of plans beyond this best-of and three date tour at the moment. But who knows – if the public loves it enough, it may spur them into doing more! Great tracklisting…is this just the beginning? Is the tour a one off, or are Tania & James recording new material as well??? Awesome!!!!! I’ve been awaiting the Tracklisting and it looks pretty good includes all the singles. I can’t wait for this one. Be interesting to hear the unreleased songs too. I think can have a 2nd wind!